On February 2—forty days after Christmas—the Church celebrates the feast of the Presentation of the Lord, calling to mind the Holy Family’s observance of the Mosaic Law (see Leviticus 12:1–8). Mary comes to the Temple forty days after giving birth to Jesus, and she and Joseph offer for her purification a sacrifice of two turtledoves, the offering prescribed for the poor. In addition, Mary and Joseph present and dedicate Jesus to God, as he is Mary’s firstborn Son (see Exodus 13:2–16). In this canticle we see the origins of the other name for this feast: Candlemas. On February 2, all of the candles to be used in the church for the coming year are blessed, and the faithful are invited to bring their own candles so that they can be blessed and used in the home for prayer throughout the year. In some churches, a candlelight procession takes place as part of the blessing; in others, people simply stand in their pews holding their lit candles. In both cases, the warm, soft beauty of candlelight serves as a lovely reminder of the Christmas celebration, when the darkness of sin was scattered by the “true light who was coming into the world” (John 1:9). Moreover, it is a much-needed reminder during the remaining dark, long days of winter that, no matter how grave things may be, “the light shines in the darkness, and the darkness has not overcome it” (John 1:5). In the feast of the presentation, we see that Jesus Christ is God’s light to the nations, “the light of the world” (John 8:12). We see Mary and Joseph humbly obeying the Law in offering Jesus to the Father, foreshadowing the offering he himself will make on the Cross. We see that, even when we experience times of darkness in our own lives, if we persevere in fidelity to the Gospel and to God’s commandments, if we allow our lives to reflect the light of Christ, then we, too, will become a light to others. To celebrate this feast, consider purchasing (or even making!) special candles to keep and use in your home. 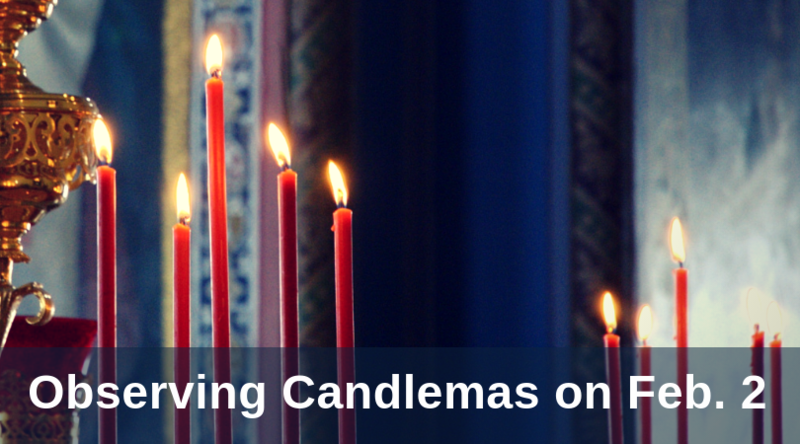 If possible, bring these candles to your parish’s Candlemas celebration so that they can be blessed during Mass. If this isn’t possible, ask your priest to bless your candles at an alternate time. Then, throughout the year, light your blessed candles during dinner on special occasions (Sundays, feast days of favorite/patron saints, birthdays or anniversaries of baptisms, weddings or other sacraments), during times of prayer (especially if you pray at night alone or with your family) or during times of vigil (perhaps awaiting the birth of a child, caring for a sick family member or mourning the loss of a loved one). The glow of a flickering flame may help rekindle your love for God in times of difficulty, or it may be a reflection of your joy. Regardless, it will serve as a sign of the One who is God’s light to the nations, God’s salvation to all people. If you have any ideas or family traditions for celebrating Candlemas, please share them with the community below. Tomorrow's post will be a how-to guide for making "stained glass" luminaries for Candlemas.